Go HERE to read part I of A Christmas Carol Story. Enjoy part II of this wonderful christmas treasure. "We have many places to visit," said the ghost, "and very little time. Come." The small, dark house faded away, and in its place stood a bright office filled with many workers. "I know this office!" said Scrooge. "I worked here. I was apprenticed to Mr. Fezziwig. Look! There he is." Scrooge pointed to a gray-haired man carrying a platter of roast beef into the office. Mrs. Fezziwig followed with a tray of pastries. Behind her came house servants carrying bread and pudding and mincemeat pies. "Stop your work," Mr. Fezziwig told the office clerks. "It's Christmas Eve!" A fiddler began playing, and Mr. Fezziwig led his wife to the center of the room. He took her in his arms, and they danced a lively jig around the office. The clerks clapped and tapped their feet, and several other couples joined the dance. The Ghost of Christmas Past glanced at Scrooge. "This certainly isn't the firm of Scrooge and Marley, is it? Do you recognize the clerk in the corner?" Scrooge stared at the young man. "Me," he whispered. "It's me." The young Scrooge laughed and clapped to the music. His eyes were bright, his cheeks pink -- so different from Scrooge's own clerk, Bob Crachit, who had huddled in the cold the night before, working quietly, his face pale and shadowed. "I hope this party never ends," young Scrooge called out. "Let's stay and dance forever!" Old Scrooge thought about Bob Crachit, who had scurried away from the office as quickly as he could on Christmas Eve, never glancing back. "Crachit couldn't wait to get away from me," he said. The music faded. Fezziwig's office dissolved into darkness. "We have one more stop," said the ghost. "Our time is running out." The ghost waved her arms, and Scrooge saw his younger self again, sitting in a garden beside a lovely young woman. The woman's eyes filled with tears as she said, "I can't marry you, Ebenezer. There's something you love more than me." "Nonsense," said the young Ebenezer. "I love no other woman." "That's true." The woman dabbed her eyes with her handkerchief. "You love money. You love it more than anything, and I won't settle for second best." The woman ran from the garden. Old Scrooge and the ghost followed her. When she stopped, Scrooge could see that she was a few years older. She was in a parlor that had been brightly decorated for Christmas. Children laughed and played at her feet. A little girl threw her arms around the woman and gave her a kiss. "Help me tie my bonnet, Mama," said the girl. The ghost nodded. "They could have been yours." The door opened, and a man entered, his arms piled high with gifts. They ran to him, hugging his legs. The man laughed and passed out the gifts. Then he pulled his wife into his arms and leaned down to kiss her. "Stop!" Scrooge clapped his hands over his face. "Take me home! I can't bear it." He collapsed to the floor. BONG! BONG! The clock struck two. Scrooge blinked. He was back in his own bed. "Thank goodness," he said, as he sank back onto his pillow. "It was a dream." "No, Ebenezer. It wasn't a dream." 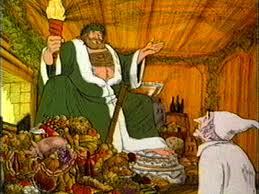 A large man, glowing and transparent, stared down at Scrooge. "I am the Ghost of Christmas Present," he said. "I have much to show you. Grab onto my robe." He clapped his filmy hands. "Hurry! We cannot be late." Scrooge touched the hem of the spirit's robe. The bedroom vanished, and Scrooge found himself on a busy, snowy street. The dark of night had disappeared, and now the morning sun peeked over holly-draped storefronts. Men and women bustled along the sidewalks, while their children laughed and skipped at their sides. "Everyone looks so happy," grumbled Scrooge. "Of course they do," said the ghost. "It's Christmas." Scrooge shook his head. "You mean they all woke up happy, simply because the calendar said December 25?" The ghost smiled. "Yes. Today they can forget their labors and their troubles, and simply enjoy their families, the fine food on their tables, and the blessings in their lives. When was the last time you stopped and enjoyed the moment, Ebenezer? Try it now. Close your eyes." Scrooge frowned and closed his eyes. The aroma of freshly baked bread mingled in the crisp morning air. Horses clip-clopped over the cobblestone street. An icy snowflake prickled his tongue, and he realized his mouth had stretched open into a wide smile. The ghost led Scrooge down the street and into a tiny house. Beside a small Christmas tree, a man was playing with his children -- three boys wearing patched trousers and two girls whose dresses were faded and frayed. The man looked up. He was Scrooge's clerk, Bob Crachit. Go to the next page to continue reading "A Christmas Carol."